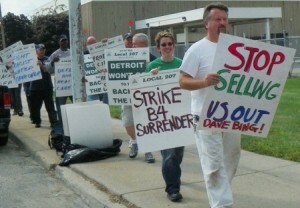 DWSD workers and supporters protest outside Huber Avenue plant Aug. 15, 2012. 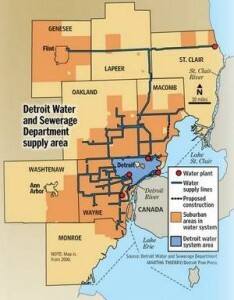 DETROIT– If Detroiters and residents of the six counties serviced by the Detroit Water and Sewerage Department (DWSD) don’t want their cities to face the massive floods that Toronto’s subway system and basements experienced in June, they need to wake up and smell the sewage—fast. Toronto Union Station underwater after massive city-wide flooding in June resulting from inadequate water/sewerage system. On Aug. 8, Detroit’s suburban-controlled Board of Water Commissioners heard a proposed plan by the EMA Group, Inc. to eliminate 81 percent of the DWSD work force over the next five years. EMA Canada, Inc. carried out a similar plan for Toronto’s water and sewerage system beginning in 1999. 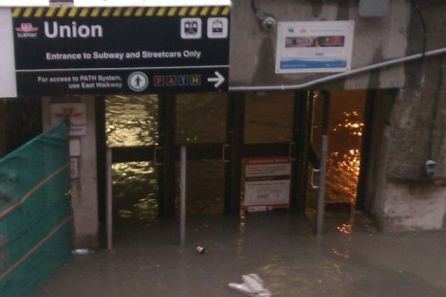 In June of this year, storms flooded the city’s homes and subway stations, inadequately contained by Toronto’s water/sewer system. 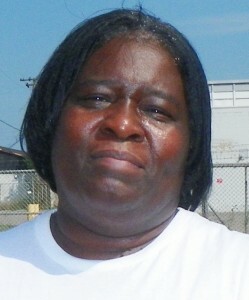 On Aug. 15, 2012, DWSD workers and supporters picketed the DWSD Huber Avenue facility on the city’s east side, calling for community support. It was the third action meant to build for a city-wide strike related to contract negotiations. Supporting it may be customers’ only chance to avoid a disaster like that in Toronto. EMA wants DWSD to cut the workforce from its current budgeted total of 2,244 to 374 city jobs. Another 361 jobs, in so-called “non-core” areas including lab, security, maintenance, minor/major fleet repairs, payroll, legal, printing, billing and mailing, would be outsourced. In its report, EMA did not account for the costs of these private contracts. Coleman said EMA claims to be doing interviews with people who do the front-line jobs. “They claim the reason for the cutbacks is that rates are too high, but rates are going to go even higher under the EMA plan,” Mulholland said. He said the local plans to take a strike vote soon. 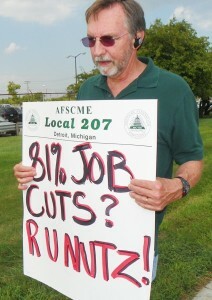 AFSCME Local 207 Secretary-Treasurer Michael Mulholland. EMA claims annual savings would be $149 million, a paltry sum compared to DWSD’s total current annual budget of $932.4 million. DWSD Director Sue McCormick said during her presentation to the BOWC Aug. 8 that debt payments account for 44 percent of the water budget and 40 percent of the sewerage budget, or approximately $382.5 million. She did not address the billions of dollars the department spends every year on other lucrative private contracts, predominantly with non-Detroit-based businesses. Contracts posted at the Wastewater Treatment Plant on W. Jefferson. Instead, she said cutting operating and maintenance (O & M) costs is the only way to decrease water and sewerage customer bills. 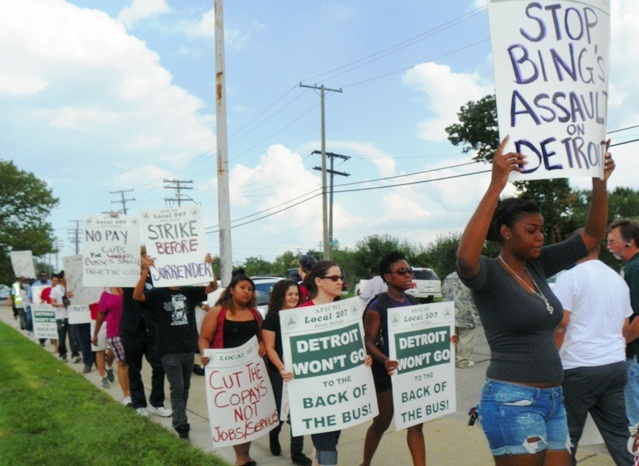 Workers march in front of Huber DWSD plant Aug. 15, 2012. Retail customers are individual households in Detroit. The term “wholesale customers” refers to all the other municipalities in the DWSD service area. McCormick said the Michigan Department of Environmental Quality (MDEQ) told DWSD that in order to meet their regulations, bills must run less than two percent of the median annual household income. She said they are currently running 2.64 percent on sewage and one percent on water. 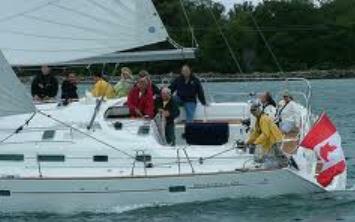 EMA VP Brian Hurding (white haired man at helm) enjoying his yacht on Canada’s waterways, evidently unworried about Toronto floods. EMA VP Brian Hurding, speaking with a distinct Canadian accent, told the BOWC that in addition to the staffing cuts, EMA is considering mothballing two DWSD operations plants and outsourcing large engineering projects. He also said changes in job design and the increased use of technology [VOD: read lucrative contracts] would further contribute to savings. McCormick’s and Harding’s entire presentations can be heard in the video below. 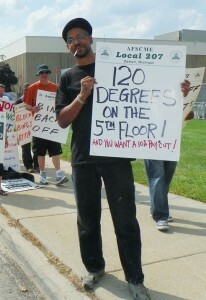 Picket line at Huber Avenue plant grew consistently on Aug. 15, 2012. EMA report is a comedy. How can one cut 81 % from workforce and do well? There is no proof for such an action. Why hire such consultants, whose work is patently false? It seems that Hurding’s argument goes like this : if one does not pay wages, then one saves the money for wages. It is like saying if one does not use gas for driving, then one will save gas money. But will he be driving? If Hurding would have talked about new technology and how automated it would be, then one may look at his argument. But he did not talk about new technology. Hurding’s argument is basically flawed and can not be rescued.